This week we’re passing our congratulations on to the three winners of this year’s competition; Henco J from South Africa, Ivan Petukhov from Russia and Jessica Valentine from the US. Hailing from Pretoria, Moscow and Washington respectively, Henco, Ivan and Jessica all joined a video call with Dana Brunetti and Carter Swan from Trigger Street Productions and our Creative Director, Kevin Spacey to answer a few more questions about the production of their films. Kevin and Dana then revealed that they’d won the competition, prompting reactions of surprise and disbelief all round. Watch their reactions as they were told they had won. Ivan’s script from Moscow, THE GIFT follows Miss Anderson who works at the city department store wrapping gifts. An extraordinary encounter with Mr Grimm, an illusionist, makes her see magic all around her. Jessica’s story, JUMP! is set during a 48 hour observation at a psychiatric facility, where Jack meets Wendy, a young woman with a unique obsession. Henco will be directing his story, THE MUNDANE GODDESS which focuses on Hera, queen of the Greek Gods, who seeks answers from a therapist about her boring home life. Each of our winners is now busy prepping for the start of filming this summer, when they will be on set in LA to direct Uma Thurman in the lead role in their short films. 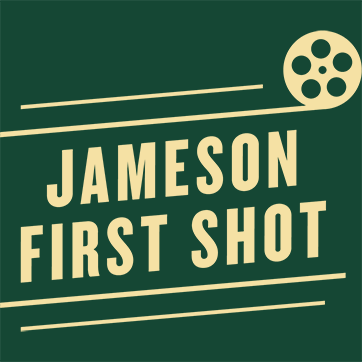 To follow our three winners’ journeys in the competition and watch their three films, subscribe to the Jameson YouTube channel.